Prepare for the spectacular at the luxurious Domaine de la Noguiere campsite! 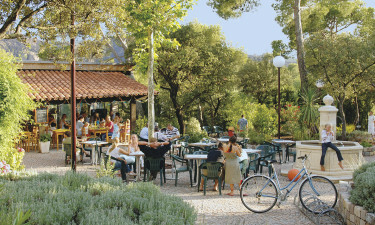 With the red rock of the Rocher de Roquebrune as scenic backdrop and the glamorous delights of the Riviera coast as your stage, the Domaine de la Noguiere luxury camping site is perfectly located to enjoy the wild splendour of the countryside and the chic resorts of St-Tropez, Cannes and Monaco. Why stay at Domaine de la Noguiere? Whether it’s adventure you crave, or simply the opportunity to unwind in a natural setting of unprecedented beauty, at Domaine de la Noguiere, you set the pace. From canoeing down rivers to the pleasures of dining in the picturesque courtyard of a village restaurant, there’s always a new discovery just around the corner. 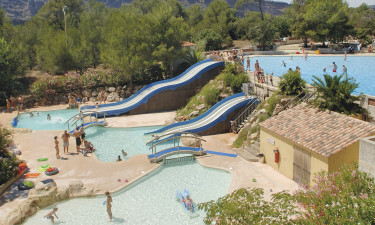 What's unique about Domaine de la Noguiere camping holiday? Great trekking at the foot of Massif des Maures mountains. Le Muy town just 3km away. PLEASE NOTE: The small swimming pool with the slides is closed for now due to re-construction of the floor. Surrounded by greenery and the epic mountain landscape, the pool complex not only offers incredible views, but a place of fun and games for children and relaxation for adults. A rocky lagoon pool, family pool, plunge pool with 7 water slides and toddler’s pool keep all ages happy. Stretch out on a sun-lounger on one of the spacious terraces with a refreshing drink and soak up the sunshine and beautiful scenery. Children have 2 playgrounds with slides, swings and climbing games to play on. Anglers have direct access to the fishing lake from the park and there is a tennis court, plus pitches for football and boules. The nature park of the Le Masssif de l’Esterel is an area of extraordinary beauty, whose trails can be explored on foot or bicycle. The rugged Massif des Maures offers hikers a more challenging climb. Hire a canoe or kayak and paddle down one of the most unforgettably beautiful places in Europe, the Verdon Gorge. Float along its turquoise waters and marvel at a true wonder of nature. For a rush of adrenaline, head to Lake Rabinon. Seasoned pros can wakeboard and water ski, whilst knee boarding is ideal for beginners. The town of Le Muy has 3 rivers flowing through it, with numerous opportunities for canoeing and kayaking. The beach town of Fréjus and village of Roquebrune are rich in historical attractions and also boast fantastic restaurants, bars and cafés. Wander the peaceful streets of Roquebrune, explore the many charming shops or stop at one of the chic cafés for a leisurely day out. 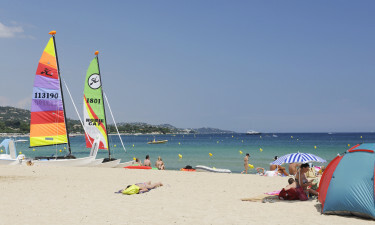 The soft sand and azure waters of Fréjus beach are ideal for a family day at the seaside. To pick up the pace, St-Tropez, Cannes, Monaco and Marseilles offer a wealth of culture, recreational attractions and nightlife. There is a restaurant, takeaway service and poolside bar. The small grocery caters to all your immediate luxury camping needs. The markets and shops of Le Muy are 3km away.